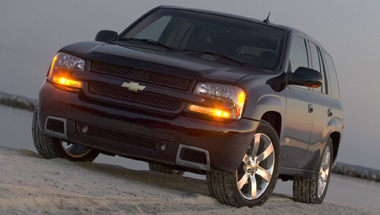 The Chevrolet TrailBlazer is an SUV that was produced by the Chevrolet division of American automaker General Motors. It was introduced in 1999 as an upscale trim line of the Blazer. In 2002, the TrailBlazer was upgraded to a new platform (GMT360 for 5 passenger models, GMT370 for 7 passenger, and GMT305 for the Envoy XUV). Production of the Blazer overlapped with the TrailBlazer until 2005, when the 2-door was sold at dealers while the 4-door was fleet only (until the 2004 model year). The 2-door Blazer was replaced by the Chevrolet Equinox after 2005. The TrailBlazer is based on a truck platform called GMT360, with all models having four-wheel drive as an option with both automatic engagement and the more traditional "4 High" and "4 Low" gearings, except the SS model which features an All wheel drive system. 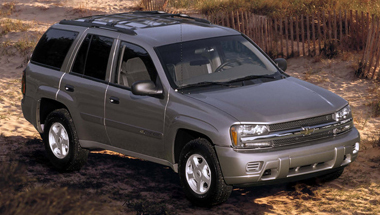 The TrailBlazer features an independent front suspension, and a five-link rear suspension. A G80 locking rear differential is available as an option on all models except for the SS which has a G86 LSD standard. An 'LT' version, has up-graded interior features, better sound system, alloy wheels, 4-wheel disc brakes, Chevrolet TrailBlazer Accessories, and a towing package. The TrailBlazer was facelifted for late 2005/early 2006. A new front fascia and interior trim were included with the refresh, but only apply to the upper-level LT models. The LS trim still has a similar front and rear fascia to the 02-05 models. The SS gets trim-specific front and rear fascias plus colormatched side skirts. The TrailBlazer comes with a 291hp, 277 lb·ft all-aluminum 4.2 L "Atlas" LL8 inline-six engine standard and an optional 302 hp, 330 lb·ft aluminum small-block 5.3 L V8 with Active Fuel Management. The inline-six makes the TrailBlazer the most powerful six-cylinder SUV in its class. 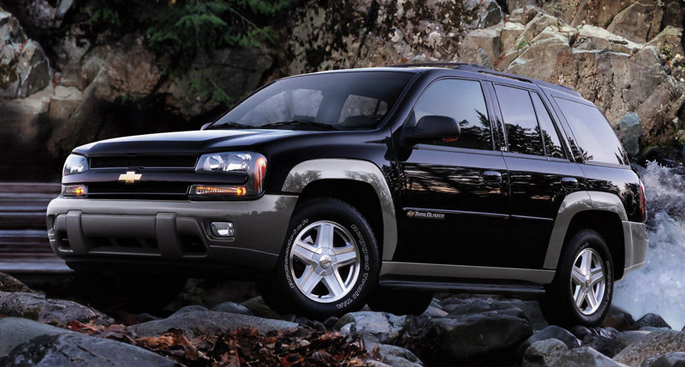 For 2006, GM's excellent StabiliTrak electronic stability control system comes standard across the TrailBlazer lineup. StabiliTrak helps drivers maintain control by reducing or eliminating skidding in emergency handling situations. 2006 TrailBlazer models have been upgraded with a revised brake system designed for improved responsiveness along with sound-deadening measures designed to reduce noise. The TrailBlazer is stable and maneuverable. It handles washboard surfaces well, a nice benefit on unpaved roads. The TrailBlazer is also quite capable off road when equipped with its sophisticated four-wheel-drive system and optional skid plates. An SS model was introduced for the 2006 model year. This was the first time a production SUV wore the Super Sport badge. This TrailBlazer came standard with a 6.0 L LS2 V8 based on the same engine that comes standard in the 2005-2006 Pontiac GTO. The LS2 is rated at 395 hp with 400 lb·ft of torque and can accelerate from 0 to 60 mph in an estimated 5.8 seconds with quarter mile times around 14.2 seconds at 100.0 mph . Other differences entail the use of a 4-speed automatic transmission, a cold air intake package, a 4.10 ratio limited slip rear differential, a ZQ8 sport suspension, specially designed front brakes with brake pads similar to those found on the Corvette, and optional all-wheel drive. The Chevy TrailBlazer's cabin is comfortable and convenient. Seats on the LS are manually adjustable. Eight-way power operation with memory and seat heaters is available on LT models. Power adjustable pedals on the LT allow shorter drivers to move the brake and accelerator pedals up to three inches closer for better positioning and comfort without having to move too close to the airbag-equipped steering wheel. Heating and air conditioning can be controlled separately by the driver and front-seat passenger. EXT models add separate climate controls for rear-seat passengers as well.